One of the lovely benefits to working in the Crafts and Design department is our constant exposure to other makers and their craft. We not only have four other studios to peek into on our way to the cafeteria, but a gallery that highlights the talents of our department throughout the year. Back in January I wrote about Trans-Form/Function, the annual ceramic show in the gallery. 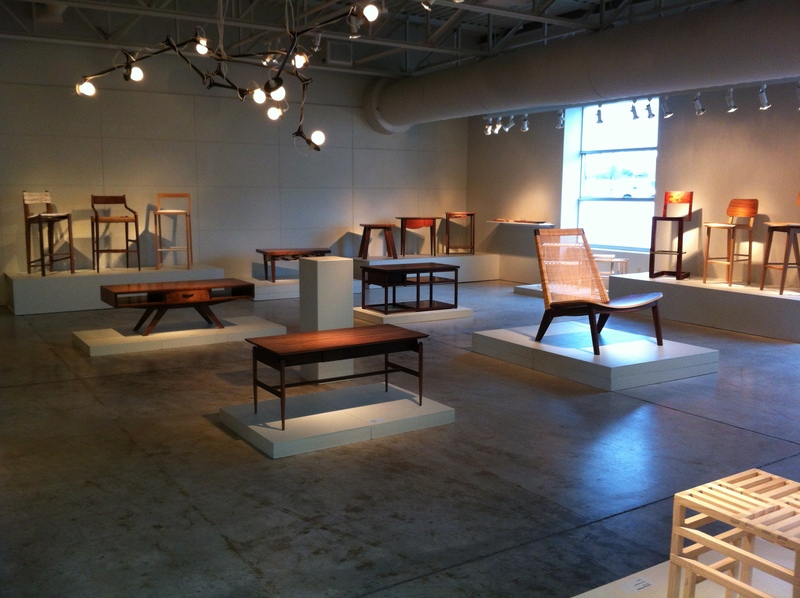 It is now time for the furniture students to show off their work, and they do not disappoint. A wide range of beautiful pieces including side tables, lounge chairs and bar stools showcase the work of over 25 makers. This show collects individual and collaborative projects, new makers and those who will be graduating this fall. Contemporary and traditional practices are highlighted, using a variety of materials. As a lover of all things "home", I was delighted to spend part of my afternoon on Thursday at this show, weaving between the walnut tables and staring up at a beautifully crafted light piece. My mind couldn't help but wander to living room settings where comfy lounge chairs might help me relax after a long day's work. I plan on seeing work by some of these talented designers in my home one day. To see the show, come by the Crafts & Design department and pop into the gallery. You won't regret it!